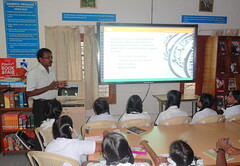 Face a Book is the Library Literacy component of the InfoLit India initiative to develop Library skills in the students. The project invite the students to face a book in reality than following or befriending with fake profiles and unknown faces. The Face a Book component consists of a variety of student and library oriented activities based on the core information literacy curriculum developed under the InfoLit India project. Visit the online interactive platform for sharing real time experiences of facing a real book.